100? 500? 12? The short answer is that it depends – but it’s probably not the number your stakeholders threw out on a whim. If this question is giving you a headache, you’re not alone. Determining how many beta testers you need for a given project is one of the most common headscratchers when planning a test. Even looking at it strategically, there are many factors that influence the number: what you’re testing, why you’re testing it, who you’re testing it with, etc. So, how many Beta Testers do you need? Keep reading to learn how to calculate the ideal number of testers for your Beta project. The idea is that any adjustment to one side of the triangle must scale in proportion to the others. If not, the overall quality of the product will go down. 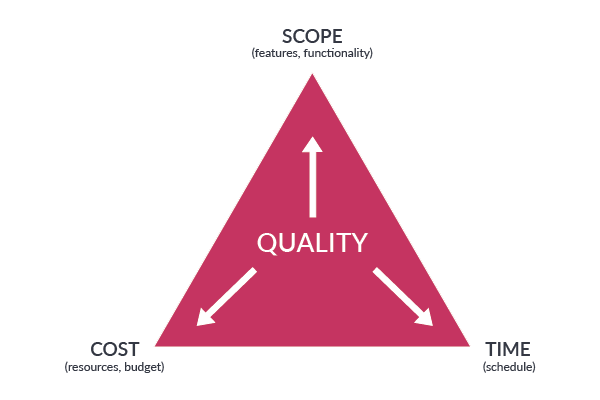 If you increase the scope, you also have to increase time or cost to preserve quality. With testers, you need enough of them to get the job done. But in the same sense as the model, pulling too many testers into your Beta project will increase its scope – affecting either cost or schedule. The right amount of testers provides enough feedback to prove the statistical significance of your findings, but not so many that you hit diminishing returns. Put another way, you want exactly enough feedback to feel confident in your results. Half of the last 200 Beta Tests we’ve managed for clients had between 30 and 120 testers. Identifying the perfect number for your project depends on your goals, your product, and your target market. Let’s consider how each of these factors affects how many beta testers you’ll need. Everything in your test, from its planning to its execution, revolves around your goals. What features do you need to test? What are your stakeholders interested in learning? Defining the answers to these questions will help you figure out how many testers you need. Are you just trying to see if you have any big bugs in a few basic environments? If so, you can start with around 30-50 testers. Any more than that and you will end up with everyone reporting back the same things. Do you need to understand the key issues detracting from the experience with a stable product? You should look for 75-100 testers. Do you need additional confidence that a little issue won’t be overlooked? Aim for 125-150 testers. Customer Validation tests should focus on achieving one specific, overall goal. Beta Tests, in particular, evaluate satisfaction with the features, interface, and other key product areas. Your product affects the number of testers in two ways. First, there’s logistics: how many units do you have available? Can you get more within the time allotted for your test? Are these units costly to produce? Second, consider the kind of product you’re testing. Is it a new product or an update? If it’s an update, how many new features does it have? On the other hand, a complex product with lots of features might need a large group of testers to cover all the product areas. You can split this big group into teams and assign these different teams different tasks to focus on within the product. This prevents your testers from getting worn out (i.e., low participation) from too many tasks or too long a test. Before you can decide how many beta testers you want, you need to figure out who you want. Read up on your target market: is it mainstream or niche? Do they have certain demographic or technographic qualities, like “40+ years old” or “Owns two or more smart products”? These different types of users will become your tester segmentations, and each one will need an adequate sample size to return accurate data. The more segmentations you have, the larger your tester team will be. For instance, a single app might have different pain points across different operating systems. Speed may be an issue in iOS, while frequent crashes could affect Android. To understand the key drivers between different groups, aim for 75 testers in each group to start. Another quick word about recruitment. You don’t necessarily need to recruit testers who can test every area of your product. Instead, plan to recruit testers who can test the product areas you’re testing. For example, if your product has voice-control features but you’re not testing them this round, you don’t necessarily need to recruit users who own a smart speaker. Do I Need 1,000 Testers? You might be thinking, “OK, so I really do need hundreds of testers then.” Not necessarily. Sure, if you’re testing a big brand name product, a few hundred testers is a drop in the bucket compared to the size of your actual market. But every project, even a big one, hits a point where the additional testers you recruit don’t offer any real value. So whether your ideal number of testers is 30 or 300, once you have an adequate sample of people reporting on a topic, a surplus of unique user reports doesn’t typically provide new or useful information. Know your goals. If you need to know your one-month failure rate within a specific margin of error, use statistical best practices to find the number of testers you need. If you are looking for major stability issues, a small group is your best bet. If you need to identify the key mid-tier issues that will have the most impact, you probably don’t need over 100 testers. My recommendation? Start in the middle – around 75 testers. Then look at your test objectives, your product, and your target audience, and add or subtract from that number. Next, look at your budget – how much budget do you need for incentives? Look at your internal resources – how are you collecting feedback? Do you have the bandwidth to manage your feedback piece by piece? If not, do you plan to use a tool that automates some of those demands? Finally, if you have access to it, look at your historical data. How many testers have you recruited for past tests? How many testers participated? How many bugs or issues came up? If you haven’t been tracking your metrics, it’s okay – start now. Metrics, alongside a thorough and well-defined test plan, are key to refining your strategies for future tests. To learn more about how many beta testers you need, how long your test should be, and to access templates and tips for test planning, download the Beta Test Planning Kit.